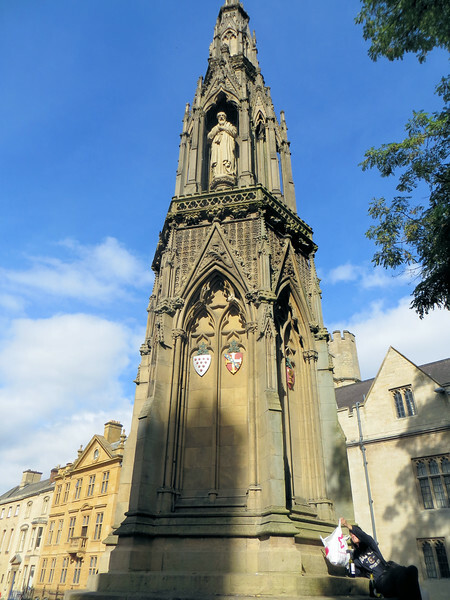 You might ask why, almost 300 years later, the Victorians decided to put up a memorial to the Oxford Martyrs. In the 1840s, Oxford was in turmoil over the Oxford Movement, which tried to convince people that the Church of England needed to connect again with its Catholic roots. Catholics had been unpopular in Britain for centuries and the Oxford Movement was upsetting to many people. Glorifying the Protestant martyrs was one way of reminding people of the evils of the Catholic Church. Ironically, the Victorian Gothic style of the monument is very "Catholic" in appearance.